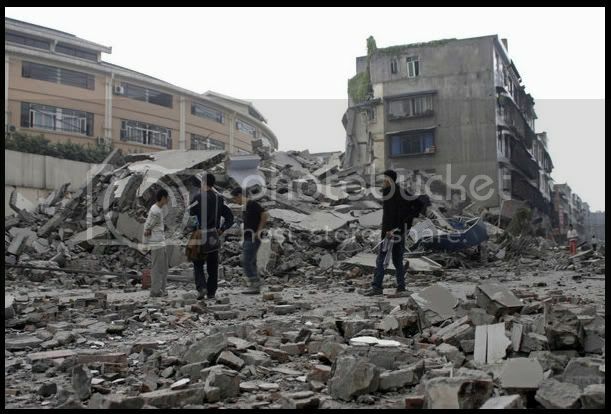 On Monday, May 12th at approximately 3pm China time, an earthquake the magnitude of 7.9 hit southwestern China in the province of Sichuan, hitting just northeast of the provincial capital, Chenddu. 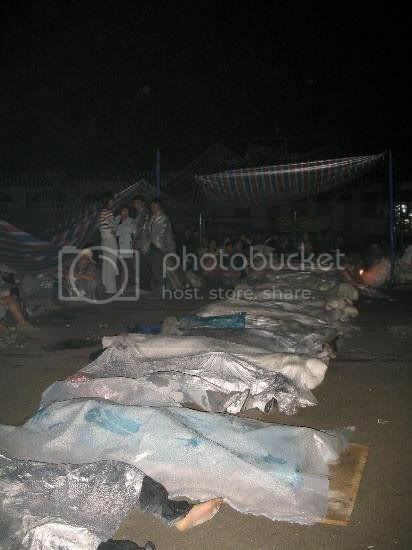 As of today, the official death toll is approximately 15,000 with tens of thousands more missing. Circiled in red is the approximate location of the epicentre of the earthquake. A terrain map of the area where the earthquake struck. 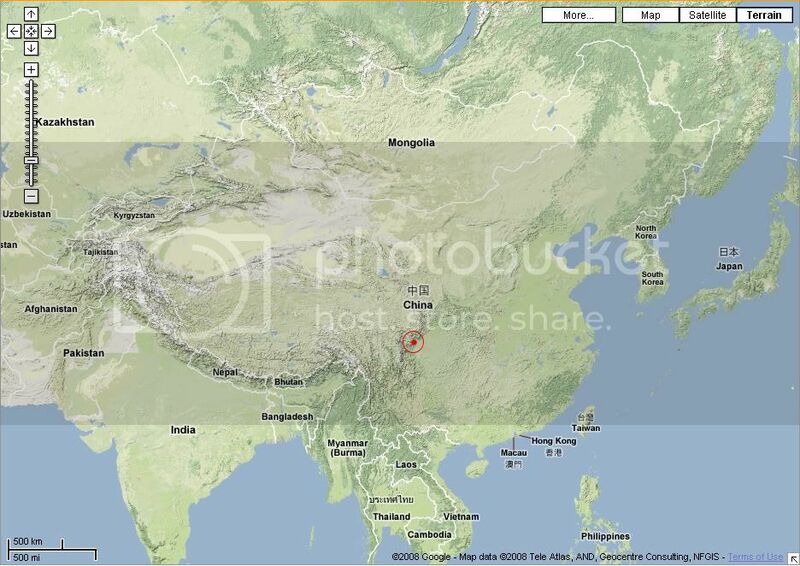 BBC's map detailing the epicentre of the earthquake. 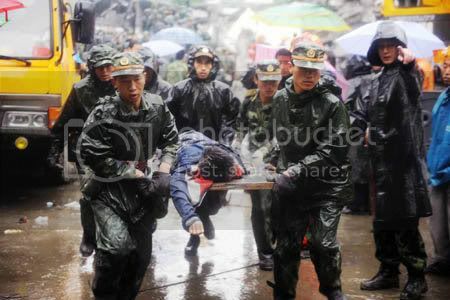 The Chinese government's response has been swift and decisive with President Hu Jintao ordering that no efforts be spared in the rescue and Premiere Wen Jiabao rushing to the frontline of the disaster within hours of the news. 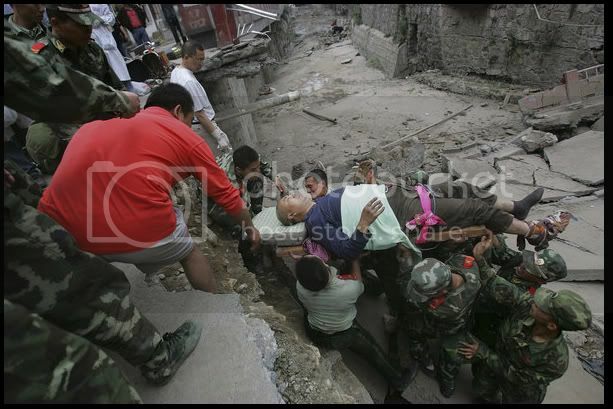 Tens of thousands of rescue workers and military personnel have been deployed to help with the rescue, but their efforts have been hindered by the fact that the location (as you can see from the second map above) is surrounded by hills and the earthquake has caused roads to be blocked with no way for the rescue workers to enter into the worst-hit areas. 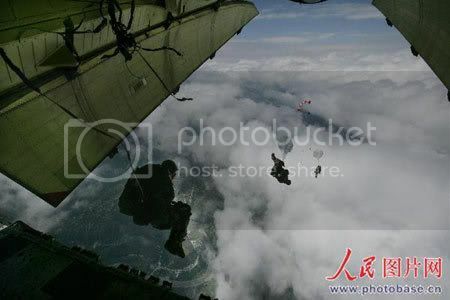 On top of that, days of stormy weather have caused mud slides and the heavy rain and wind have delayed initial decisions to send in paratroupers by air. 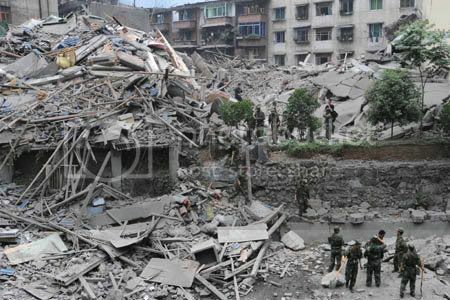 Recent updates, however, have announced that regardless of the risks, paratroupers have been deployed as have aid supplies, air-lifted into the worst-hit disaster areas at the epicentre of the earthquake. 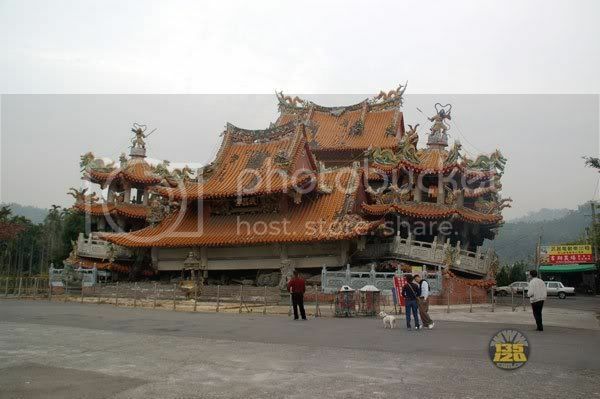 Detailed news can be found on all media sources, therefore I won't go too much it, especially since the situation is literally changing by the minutes. 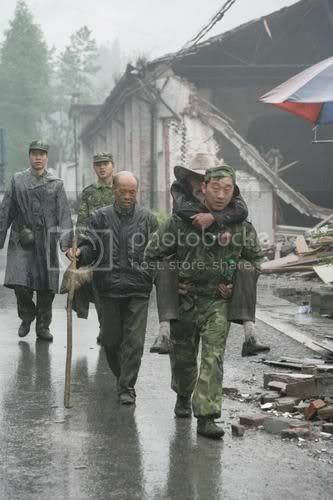 I'll leave this post with a few photos, some of the disaster's consequences, some of hope, some of our brave brothers and sisters in uniform battling to find life amongst the ruins, and some of China's currently most beloved leader who has in this time of crisis, joined with the people in heart and mind. 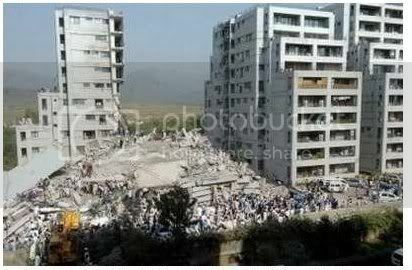 Airial view of one of the cities struck by the earthquake. 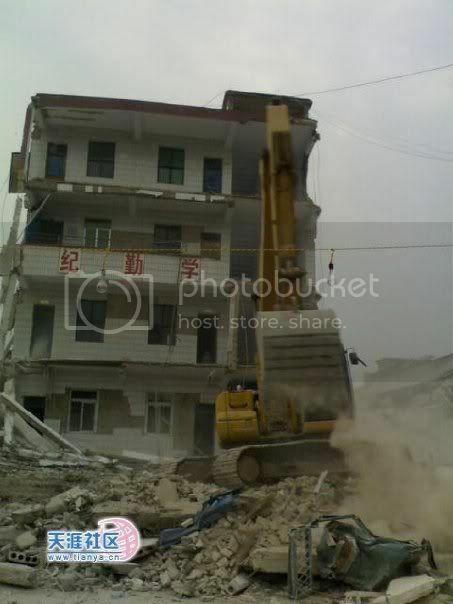 Cities within minutes were reduced to rubbles. 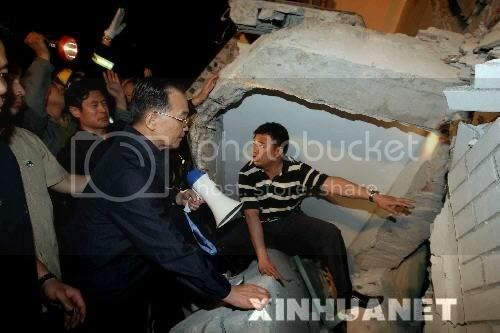 The quake was even felt in Beijing. Like out of a movie...except this is real. 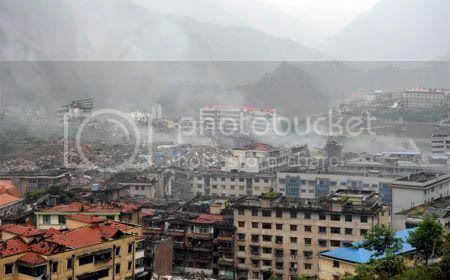 Buildings have been razed to the ground. Remember that story about how animals can tell when these natural disasters are about to strike? 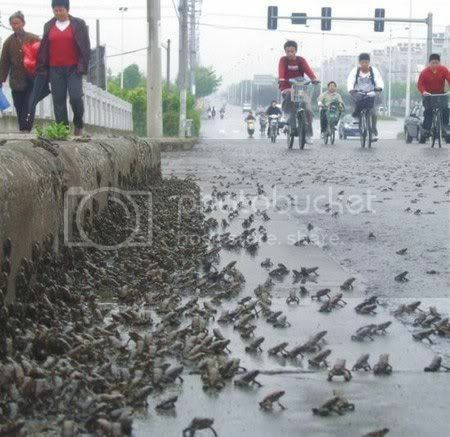 Apparently it's true, those are toads. 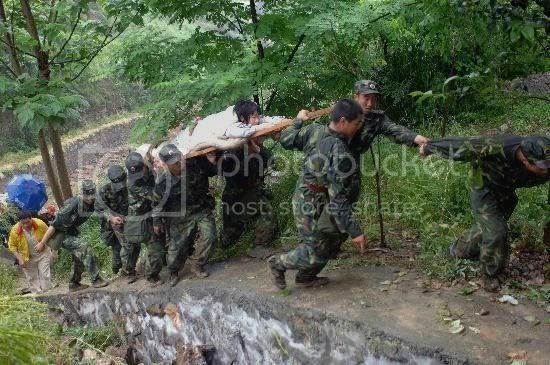 Peoples' Liberation Army (PLA) personnel on their way to the rescue. 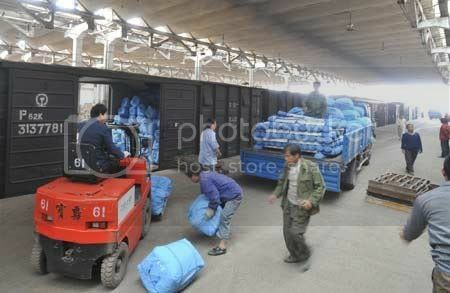 Supplies are on their way. 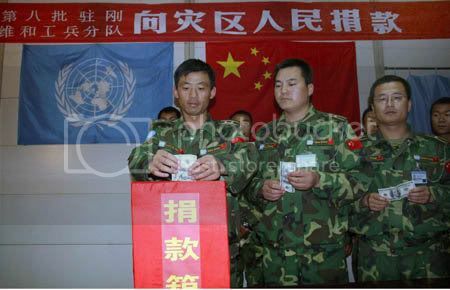 PLA soldiers serving under the United Nations far away from their homeland donate to the victims of the Earthquake. 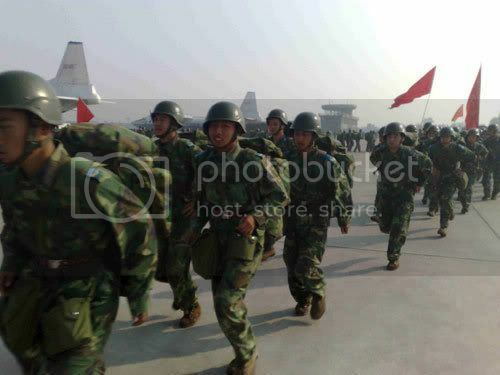 $100 USD each, that's about $700 RMB, probably a month's pay, giving their lives and their money for the people and their country. 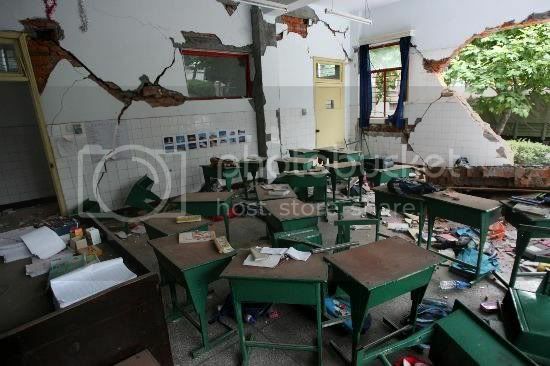 Several schools in various cities collapsed, trapping and killing hundreds of students in classes at the time. 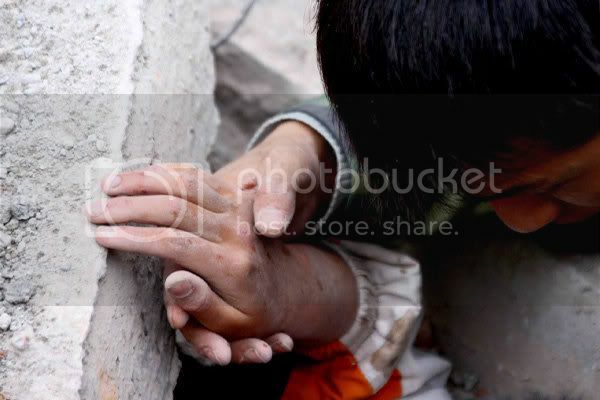 Heartbreakingly, this image is now not rare in the areas hit by the earthquake. 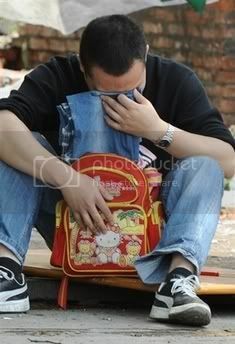 A father breaks down, mourning for his child lost amongst the rubbles. 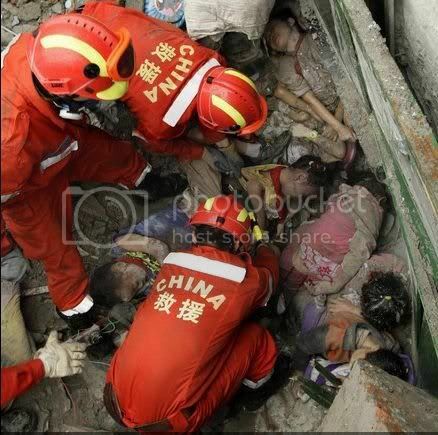 The heartbreaking photos are endless, some very graphic. 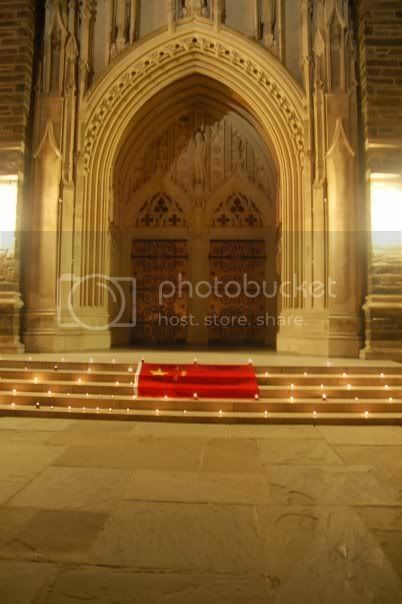 I will post links to galleries at the end of this post if you wish to see all of them a, but I personally can't bear to post them all onto here because the more I look at them the more I feel despair, and I KNOW that that's not going to help with anything at this moment and time. Hold on, hold on, we'll make it through! Braving the rain and storm in a race against time. 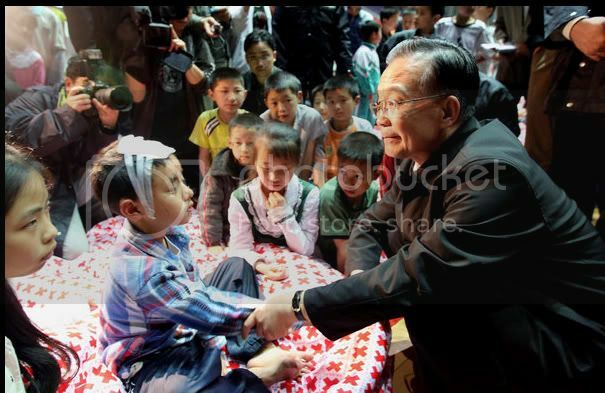 These boys are the pride of the Chinese people. 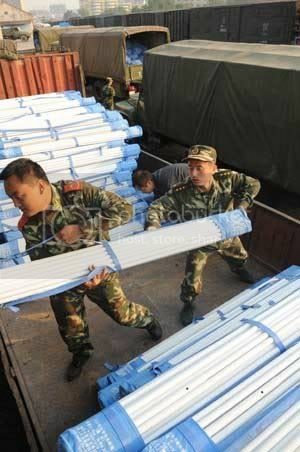 Always, an army of the people. 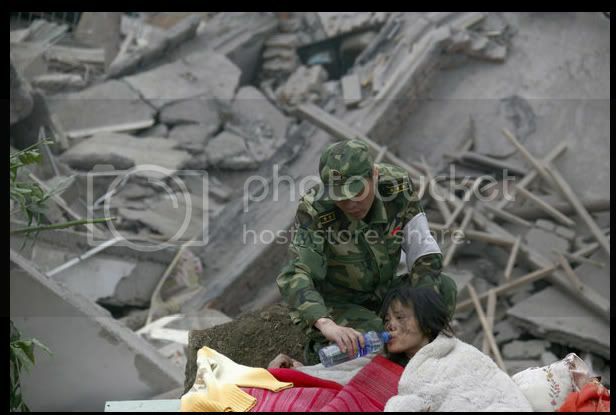 PLA helping an injured person out from the rubbles. 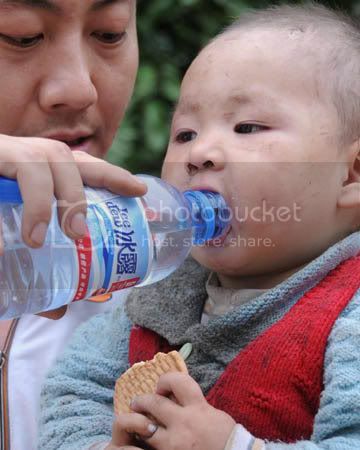 Giving water to a survivor. 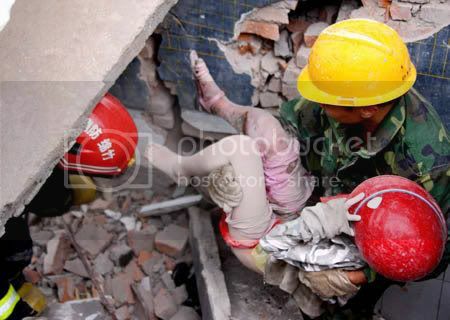 A young child is rescued from the piles of cement and steel. 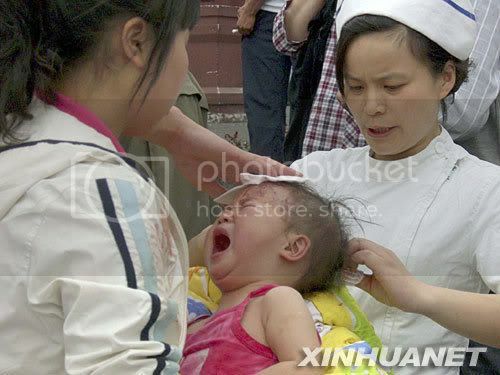 A pregnant woman is saved. Hurt, but in good hands. 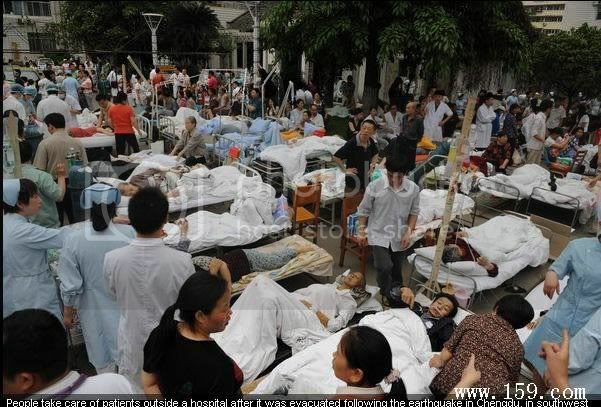 Survivors are treated at a make-shift medical centre. 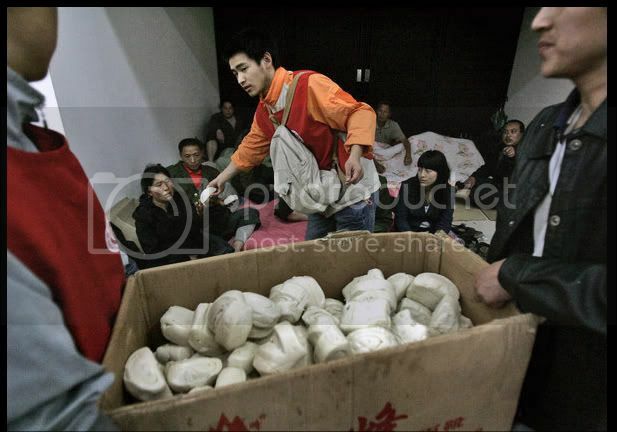 Volunteers hand out food (manju) for the people. 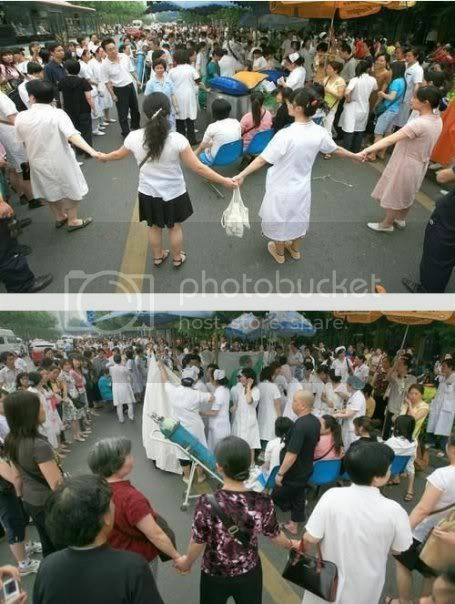 People joined hands to guard and protect a mother giving birth. 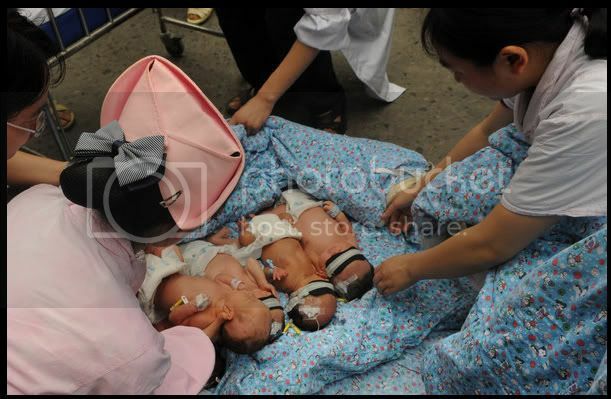 Bottom: New mothers wait for supplies with their newborns. 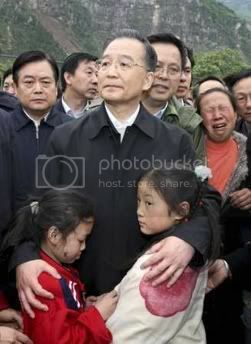 The entire country's people stand united in the face of disaster. 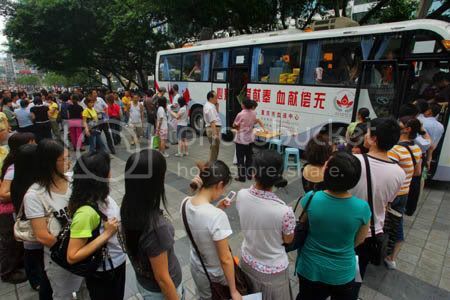 Lining up here, people donate blood to help the rescue effort. 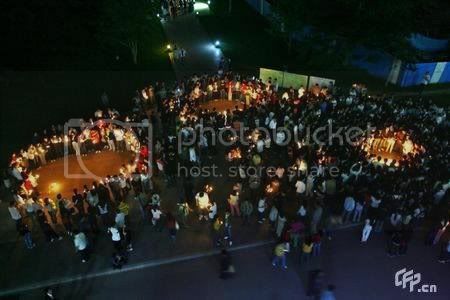 Candle-light vigil held by students for May 12th. 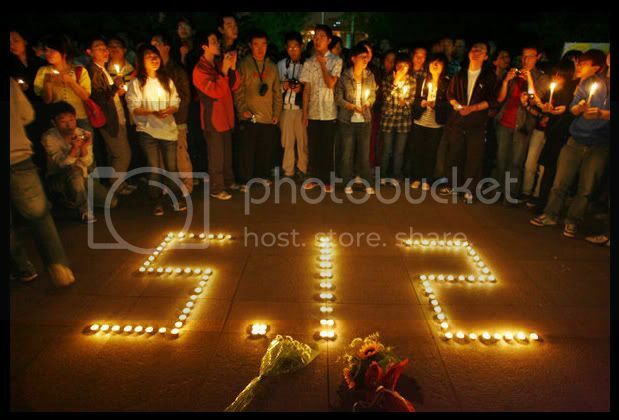 Linked in heart and mind to our brothers and sisters. 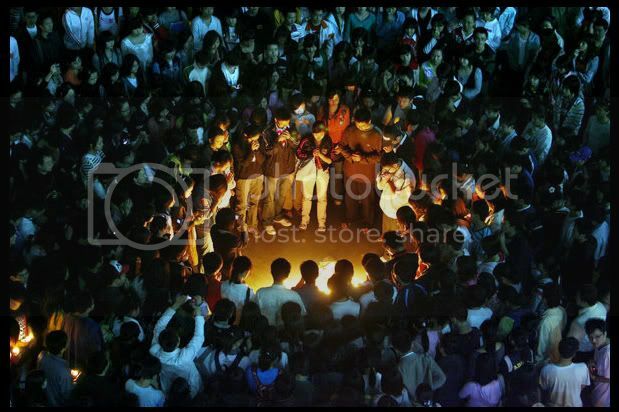 Chinese students at Duke university in Durham, USA. 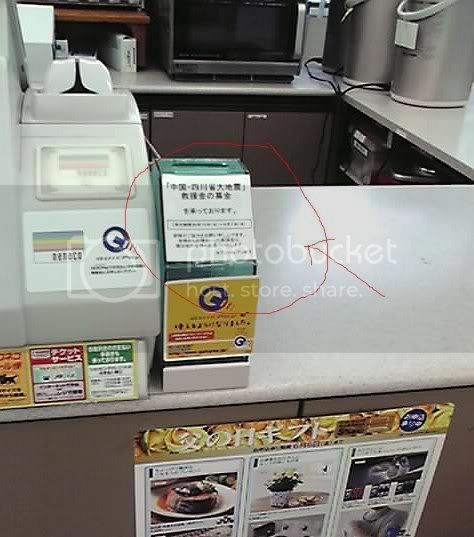 In Japan, donation boxes are set up in stores for the earthquake victims. 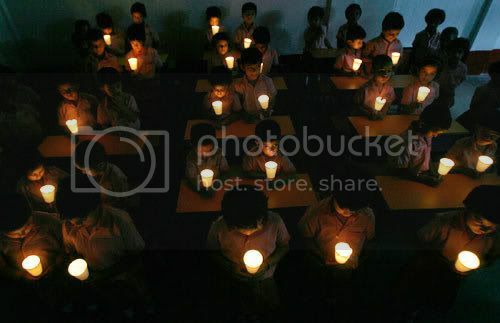 In India, students hold Vigil for victims of earthquake. 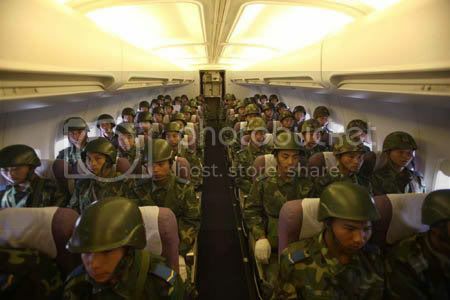 The Premiere was on a plane to the frontline of the disaster within hours of the news. 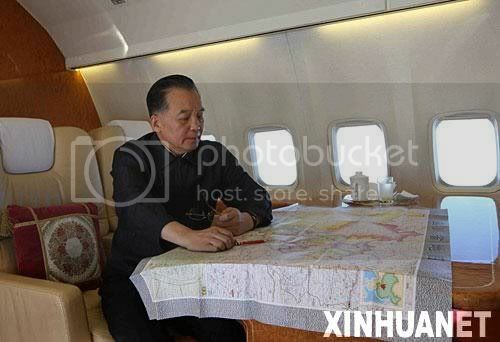 Here, he sits in the airplane, pouring over a map and bracing for the impending restless days to come. 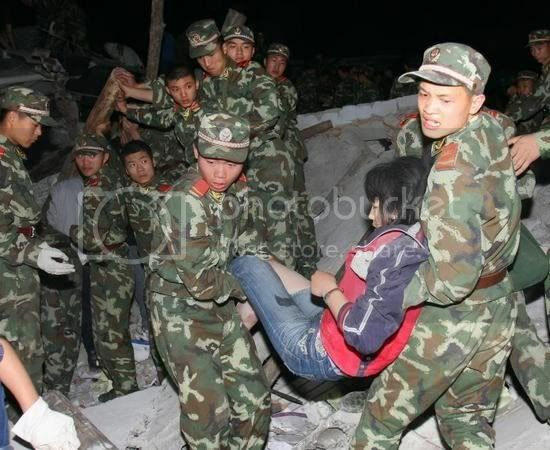 The Premiere shouted through a bull-horn to survivors trapped in a building for them to hold on and that rescuers will get them out no matter what. 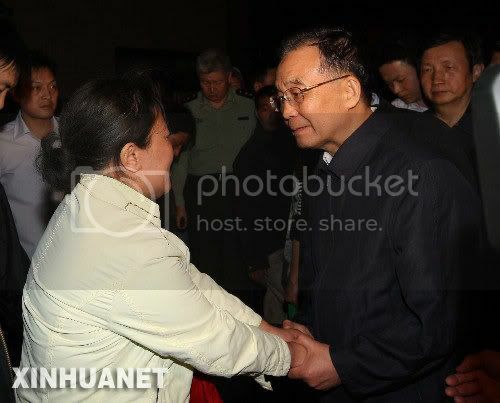 Premiere Wen's 66 this year, and yet when disaster strikes he's one of the first at the centre of the rescue effort. 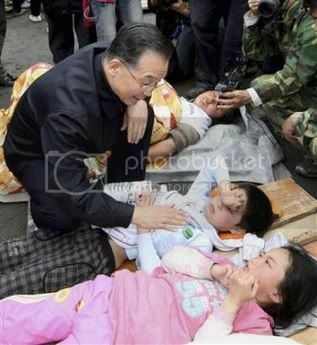 Much like his involvement to the snowstorm in Southern China earlier this year, when both he and Presiden Hu Jintao went to the disaster zones to personally direct the rescue efforts. 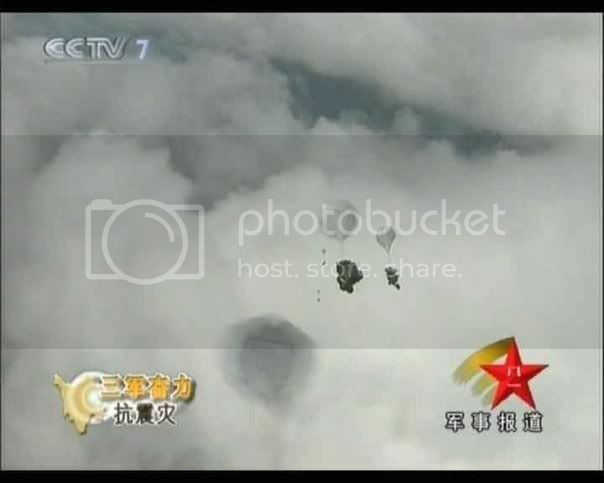 MV "China Earthquake - Do You Miss Me?" [EDIT1]: May 14th, afternoon. 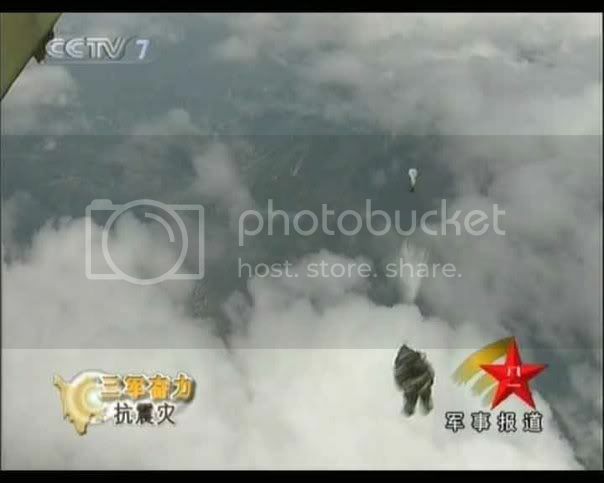 Paratroupers have been sent in!! A great nation and great people. 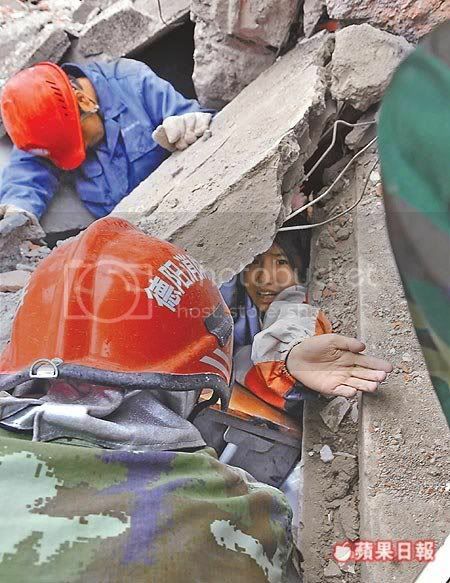 The disaster can only make the nation more united and more strong! 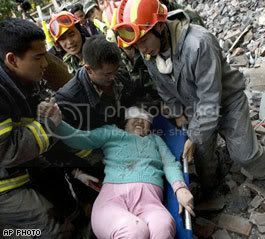 It was awful that the earthquake had happened, but it makes me glad to see that people are so kind to eachother. And, another thing. 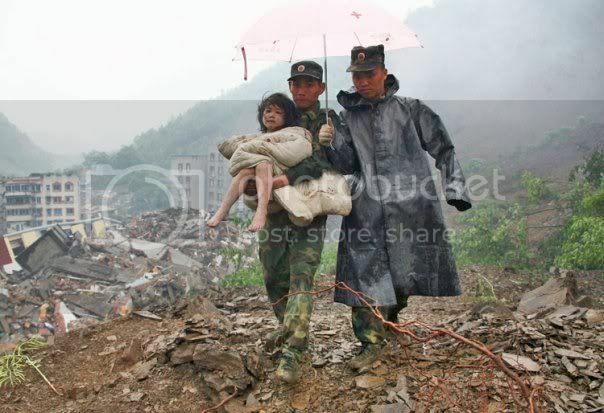 Just compare the swift and decisive way that the Chinese government has responded to the disaster, and the way the US government "responded" to the Katrina disaster. Make the comparison for yourself.